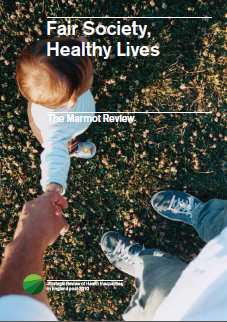 This 2010 Marmot Review proposes a series of evidence-based policies and a monitoring framework to address health inequalities in England. It summarizes the findings of a two-year independent review, chaired by Sir Michael Marmot, head of the University College London (UCL) Institute of Health Equity, and former Chair of the WHO Commission on Social Determinants of Health, which published Closing the gap in a generation: Health equity through action on the social determinants of health in 2008.
creating and developing healthy and sustainable places and communities. These policy objectives are further broken down into 20 recommendations. The authors take the view that action to reduce health inequalities must involve organizations and governing structures outside the health sector, and be included in policies at all levels of government. This report will be of interest to policy makers at local, regional, and national levels who are creating their own evidence-based strategies to achieve a fairer distribution of health. Since the review’s publication, the UCL Institute of Health Equity has supported the implementation of its recommendations across England, including contributing to the Mayor of London’s health inequalities strategy, and working with the London Health Observatory to monitor the key indicators that were suggested in the review. access a framework for delivering and monitoring reductions in health inequalities along the social gradient, including a list of process indicators, output indicators, and examples for each of the 20 policy recommendations.